Is it Wednesday again? I don’t know about where you live, but time flies here! 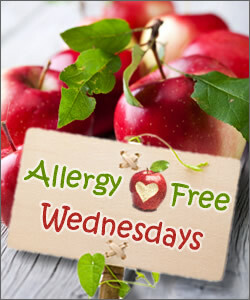 Welcome back to Allergy-Free Wednesday – a weekly allergy-friendly party! We had 64 wonderful entries again last week (check them out here)! Red Velvet Cake @ Pumpkin’s Pantry – Wow! This looks a-ma-zing! I love all the healthy ingredients she used, including beets. I would obviously have to use different frosting. Strawberry Avocado Smoothie with Dates and Hemp Seeds @ Cara’s Cravings – Again, I love how nutritious this is. I would use coconut milk instead of almond milk but otherwise it looks perfect for me. Hot Chocolate Granola @ Quick, Easy, Cheap & Healthy – If you know me in real life, you know I am a true choc-o-holic. I can’t wait to try this. I’m hosting this party with four fabulous bloggers: Tessa@Tessa Domestic Diva, Michelle@The Willing Cook, Laura@Gluten Free Pantry and Amber@The Tasty Alternative. Please link back to this party. You can grab the badge in the bottom of the right sidebar if you wish. Remember, your link will show up on all 5 blogs! Please note: If you are reading this in a reader you will need to visit my site to see the link-ups. Thank you for hosting another week! This week, I shared my grain-free Pear, Apple, and Blueberry crisp. It uses my grain-free granola (featured by Amber this week!) which really gives it a crunch as if you were using oats and wheat flour. I top it with french vanilla coconut ice cream! Thanks for hosting and for all of the wonderful contributions! Thanks so much- yes, I see you’re nut-free. I actually just saw a great cream cheese recipe using coconut instead of nuts @ http://www.realsustenance.com -maybe that would be a good sub? Thanks for hosting! Oh yes, I saw that. Looks divine! Thank you for hosting and i am so glad everyone liked my quinoa flat bread! Linking up GF, vegan, gumfree dinner rolls this week! Thanks so much for hosting this! Such a great idea, so glad I found all of you guys! I just posted my No-Bake Oatmeal Chia Chocolate Chip Cookie Balls and Creamy Dairy-Free Spinach Dip. I kook forward to participating in more of these as all of my recipes are gluten-free and as of recently, almost all are also dairy-free! Thanks again! So glad to have you Beth! Thanks for hosting! Your party link is shown at the bottom of my page..